After what seemed like forever, the karting season finally started at the weekend with the first Club100 race at Buckmore Park. 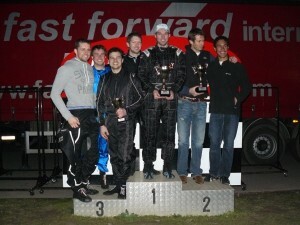 As we’ve previously announced, Kart365 are competing in the 2012 Rookie Endurance Championship as a team of 2. Our lead driver, James, has been involved with the series for the last couple of years (previously racing as part of the ‘Skid Marks’) while I’ve raced a few times as a backup driver. I’m going to be honest, we had high hopes going into this race. A year ago we grabbed a podium on a horrible wet race but really should have done better – a dodgy pitstop and a few spins dropped us down the order – so this was a chance to right the wrongs. It feels a bit dull to talk about the weather but it was a stunning day – bright sunshine, nice and warm, and hardly a cloud in the sky… which made a nice change to the usual drizzle that’s the staple for a February race at Buckmore. This was also a chance for me to try out a new toy – the GoPro HD Hero 2 – which had been painstakingly attached to my racing helmet the night before. So, with the new season butterflies still rattling around my stomach, I kitted up and headed out to start 25 minutes of ‘practice’ before swapping with James so he could get to grips with the track and, more importantly, put in a killer qualifying lap. Kind of. We ended up 6th in class, although a couple of tenths was all that separated the majority of the grid. We also knew from experience that a great qualifying session can quite quickly end in tears with a bad start so felt reasonably content. The plan was for James to kick things off, come in for a refuel after about 15 minutes, and go straight back out for another 15 (assuming that we didn’t pick up any black flags or mechanical issues). For once things went as they should and by the time it was my turn to get involved we were running first in class with a decent gap to our nearest challenger. To be honest, we weren’t pushing as hard as we could – the key to Club100 Endurance Races, particularly in the lower classes, is to keep the kart pointing forwards and avoid taking people out. There’s a video below from my first stint with a bit of drama but that’s about as hair raising as it got for the first hour or so! All in all we kept ourselves out of trouble (other than a little spin towards the end of the race and coming in a few seconds early for a pit stop) and by the end won with ease – something we really didn’t expect. Next up is Clay Pigeon in Dorset which neither of us have driven before… things are likely to be very different there!